Subtitled “three centuries of British angling prints” this is one of those once-in-a-generation books, if not an even rarer bird than that. The last author to make a of comprehensive attempt to cover angling art was Shaw Sparrow, whose magisterial Angling in British Art rolled off the press in 1923 and which remains the standard work on the subject. 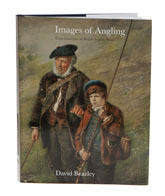 That monumental tome covered every kind of art, whereas David’s book is confined to the much narrower and more easily researched area of prints, but if you own Sparrow, you owe yourself the pleasure of supplementing it with this new work, which forms a great companion to Angling in British Art. The price might put off some, but this is a lush volume printed at the highest possible quality and here heartfelt thanks are due to Farlow, who stepped in with a large grant which finally made it possible for Images to be published, given that the limited audience would otherwise have meant that sales would not have covered even the printing costs. So we are lucky indeed to have this work, especially because it is, as far as I am aware, the author's very first book. If you love prints, you can look forward to 250 pages of the best of them, written by the national expert on this niche subject. Absolutely everything is covered, from the earliest prints, right through to the present day, together with a clutch of useful appendices describing print making methods and checklists of prints by artist and title. Given the way the odds were stacked against it, we can consider ourselves lucky to have this wonderful book and though the text is a little dry and even given that prints aren’t everybody's bag, you still ought to consider Images of Angling, if only to support a noble gesture by an old, old tackle maker.